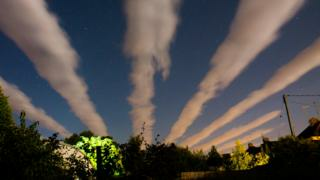 Spectacular cloud formations known as 'cloud streets' have been spotted in southern England. 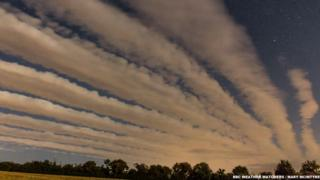 The long streaks of cloud were seen by BBC Weather Watchers in Oxfordshire and Gloucestershire on Thursday evening. 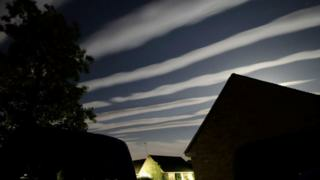 BBC weather presenter Simon King said the clouds are not uncommon in the UK but these stood out against the fading light of the sky. 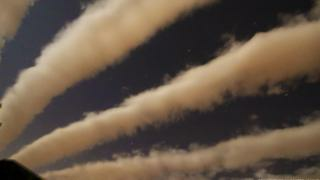 "Cloud streets are essentially long rows of cumulus cloud aligned in the sky with the wind direction," he said. Warm air on the surface rises, cools and condenses into cloud. In certain situations a warm layer of air in the lower atmosphere, called an inversion, acts as a lid preventing air from rising any further. This means at the top of the cloud, the cooler air is forced out horizontally where it will then start to sink back to Earth. In this area, cloud doesn't form, so it is clear. This all sets up a cylindrical circulation which is parallel with the wind, creating the long row of cloud. The phenomenon was spotted in Oxford and Tackley in Oxfordshire, and Little Rissington and Cirencester in Gloucestershire. Video What is a shelf cloud?